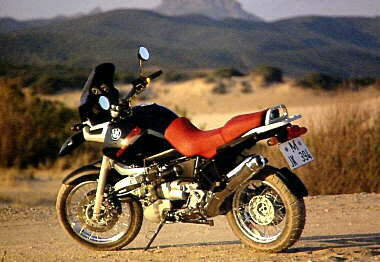 A new generation of boxers first appeared in 1993 with the R1100RS. Everything changed including the engine which featured oil as well as air cooling. Although previous models also had both air and oil cooling they are called airheads. The new generation relies more on oil cooling and has smaller cylinder fins. For this reason these new generation boxers are often referred to as oilheads. They also had refinements to previously incorporated features e.g. The oilheads (except the R1100S) have no real frame but use the engine and gearbox as stressed members. At the front they feature Telelever suspension and at the rear paralever. Click the image on the left of the very similar R11RS to see it enlarged. Telelever is BMW's very successful patented front suspension. It separates steering and braking forces and virtually eliminates "brake dive". You have to look closely to see that it is not conventional telescopic forks. Pivoting on the front of the engine is a triangular subframe. This is attached to the steering and front suspension (single shock absorber). Take a look at the telelever drawing of an R1100RS. 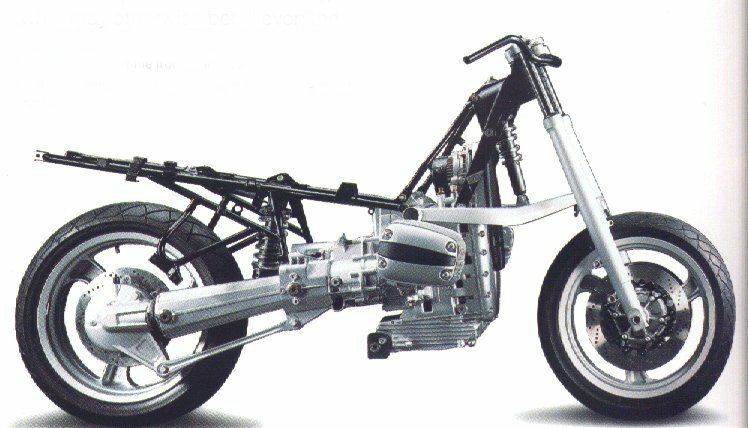 The rear suspension uses paralever as on previous models but with the shock centrally mounted between the rear wheel and the engine. Bolted on to (and pivoting on) the gearbox is a rear subframe which attaches to the rear suspension and seat assembly. The rear wheel remains fixed by 4 lugnuts. is capable of high mileages . 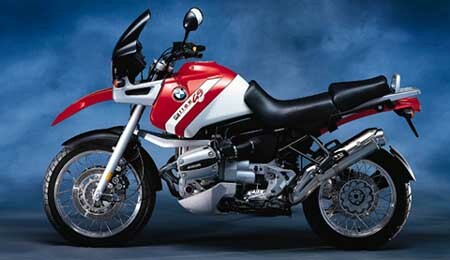 For model year 1999 BMW released its GS model fitted with the 850cc engine. This was mainly to address the needs of novice riders in Europe. Restrictors can be fitted to limit power to the new European limit for some novices of 33bhp. However, some of those who have ridden the 850cc GS prefer its smoother, freer-reving engine. 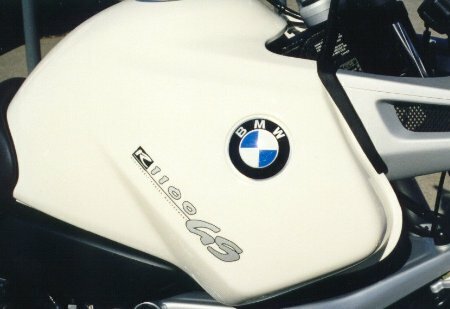 The image on the left shows an R11GS fitted with many of the BMW accessories. Click on it to see the bigger picture. (Note that what is an accessory and what is a standard feature varies from country to country). The following order came from the Owner Survey, favorite first. For further details of luggage and some alternatives see customizing, luggage . ABS and RID are extremely popular - most owners have them. However in the survey they were treated as features not accessories. BMW engine bars must be removed to change the oil and filter! However they do not use the potentially weak area around the footpegs like a few aftermarket alternatives. (Some of which have to be removed to check the valve clearances). The BMW alarm was withdrawn for unspecified technical reasons during model year 97. It could be a coincidence but the few owners that had them reported several problems. The survey also has a list of least favorite accessories. Some accessories score quite highly on both the lists! 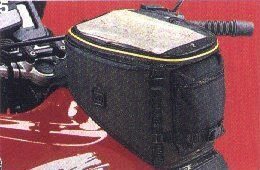 For example for some owners BMW saddlebags are neat and good looking while others find them small and odd-shaped internally. and had yellow seats (with black as an optional alternative). There is also a no cost black option - black front wishbone and engine covers. The red model has the black option, the others do not. Look under the tank for the black suspension strut and black engine (except cylinders). The picture of a 97 model offroad (by coincidence also red) shows the black option. inlet and exhaust valves reduced by 2mm and stems by 1mm (to reduce surging or increase low end grunt?). No change in published performance specs. Also a new oil control valve installed from black engine number 41956271 and silver engine number 41959303. It was an attempt to make oil level more consistent but at best only a partial success. Best advice to put on sidestand immediately after engine switch off and leave overnight before checking still applies to all R11GS models. 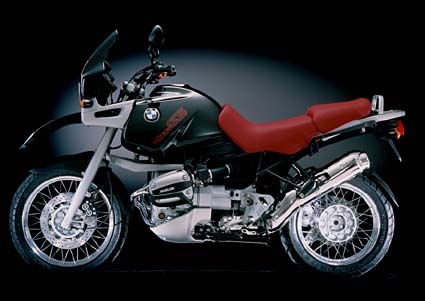 To mark the 75th anniversary of the first BMW bike, the R32, limited editions are available of all oilheads. 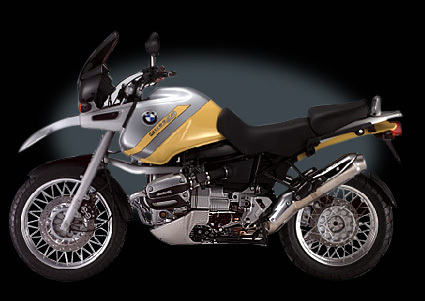 R850GS launched. Very few changes in official specifications from the R11GS. In Europe colors - red, black and Kalahari yellow. In US, Kalahari yellow replaced by white (as image on left). Final limited production two tone paint job available at extra cost - silver metallic/Dakar yellow (as image on left). ABS II updated to reduce initialization problems especially in cold weather. In August 1999 the final R11GS rolled off the production line in Spandau, Berlin. 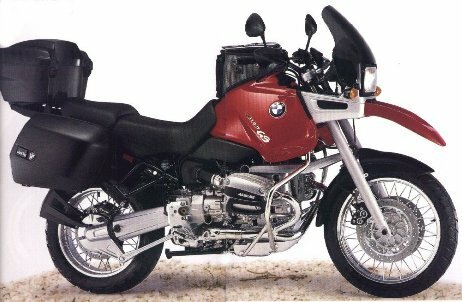 It had been the most successful model of the GS models with 39,104 examples produced since September 1993. 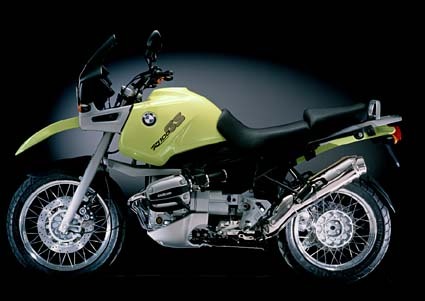 The R850GS continued unchanged. In September 1999 (i.e. 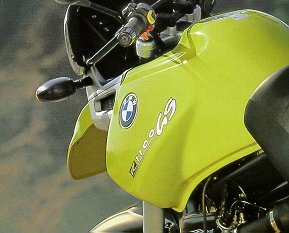 the start of Production year 2000) the R1150GS began its production run. It is a major revision of the R11GS and features the following differences. 5bhp more power and flatter torque curve. (1st higher, 3rd-6th closer and 6th (aka "E" for Economy) is an overdrive). new turn signal mounts that are more flexible so harder to damage and also easier to remove (can be retro fitted to the R11GS). new black inner mudguard and bash plate. new hand guards attached to bars inboard and to bar ends outboard with good coverage and a strong backbone. new longer gear shift lever. Revised sidestand switch that allows you to start the engine in neutral with the sidestand down. It only kills engine if you shift into gear before raising the sidestand. New colors: black, mandarin yellow, metallic silver. bags (all aftermarket R11GS bags e.g. Jesse, Givi are transferrable). overdrive (6th or "E") is great for touring. All in all, a nice evolution of the R11GS. You can jump off the old one and feel straight at home on the new one. All US 49 State R11GS have as standard both catalytic converter and carbon canister. They meet the strictest emissions guidelines BMW expect any time during the current engine's production life. This includes new regulations to come from California's Air Resources Board. The specifications for other countries vary. Production for the new model year starts after the annual works holiday in August. The production model year runs from September to August e.g. model year 98 runs from September 97 to August 98. However there is always a delay between production and registration. So not all bikes registered during that period are from that model year. For example some 98 models were registered during October 98 which falls within model year 99. Individual changes are sometimes introduced piecemeal during a model year. This means that a particular bike may not necessarily have all the changes listed for its model year. An individual bike may have pieces from a following production year retro-fitted by a dealer or owner. Also, the R11GS "frame" can break when used very extensively and heavily off-road. However, only a tiny number of failures have occurred, mostly in Australia. For more information, see Frame reinforcing kit and also David Loone's R1100GS page . However, don't get too worried, in the unlikely event that you do break your frame BMW will replace it. Despite this, the R11GS retains real offroad ability. Many owners take their R11GSs way offroad without problems and really enjoy doing so. The ABS fitted to the R11GS can be switched off when offroad. However on certain surfaces some owners prefer to keep it on. 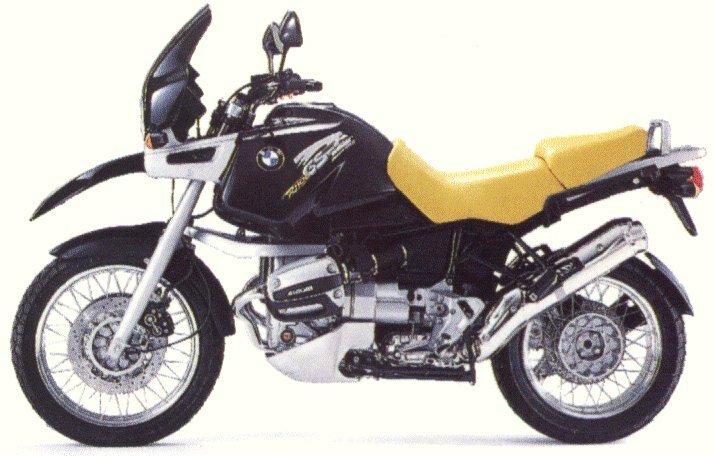 An alternative bike many potential R11GS owners consider is the BMW R1100RT. They are mechanically very similar and both make excellent long-distance tourers solo or two up. S. Cary Littell Jr hosts the definitive R1100RT webpage. Based on many posts from owners who own or have ridden both, here is a comparison of the two. Some have suggested that an R11GS with large fairing (Aeroflow or Parabellum) is more fun and more flexible than an R11RT unless you just want to tour. The fairing can be easily removed for twisties and when going offroad. Fuel injected engine (1085cc air/oil-cooled boxer twin) with telelever and ABS. Fuel injected detuned Ducati 900SS engine (904cc 90 degree air-cooled V twin) with modern styling. 742cc 52 degree V twin engine. Detuned Firestorm engine (996cc 90 degree V twin) in uprated Africa Twin frame. Transversely mounted engine (1064cc 90 degree V twin). Fuel injected engine (885cc triple) in a re-designed frame with new plastics and luggage options. 849cc 10 valve parallel twin in Deltabox frame. Comparison v Tiger, both ridden through Death Valley. R11GS beats Honda's VFR750 into second place in top 10! A few quotes from some of the above articles. "BMWs have never been regarded as fun machines, but this one shatters the dull, Teutonic image"
"the plushest, most beautifully finished trail bike ever"
"build superb - everything beautifully manufactured and put together"
"it's as much fun charging down country lanes as it is in and out of gaps in cities or cruising on motorways"
"an accomplished tourer, passable trailbike and A-road scratcher par excellence"
"it's about covering huge distances quickly in supreme comfort"
"riding position is true armchair - wide bars, wide and deeply padded seat"
"450 miles in a day two up without trouble"
"pillion and luggage make zero difference to comfort, handling or performance"
"massive improvement on old two valve boxers - faster, smoother and exciting"
"quiet, low down, no messing pull"
"crack the throttle open in first and it'll loop over backwards"
"low down grunt is about as subtle as a smack in the face"
"doesn't take much concentration, the ideal long-distance scratcher"
"blisteringly fast from A to B"
"maybe the fastest A to B bike ever"
"steering is amazingly stable when cornering even on bumps"
"handling is a gas. The harder I rode, the better she behaved. Yank the bars for a fast and late entry, lay her on her side, get on the gas." "try chicanes because feeling that huge bulk slew 90 degrees through the vertical within a couple of seconds has to be experienced to be believed"
"leans to angles that are truly mad"
"can put up a respectable fight against a 916"
"ABS is excellent on road and suprisingly good on hard dirt roads"
"huge fun slamming on (ABS II) brakes at 80mph, hearing a moment of tyre squeal then coming to a fast safe halt"
"at the moment of wheel lock there is no more than a slight pulsing through the brake lever, unlike on the K-series (ABS I) which tend to leap into the air"
"anti-dive Telelever works well with the GS's long travel suspension"
"the wacky suspension means you never, ever have to slow down over bumps"
"torque reaction from the Paralever shaft is barely noticeable"
"the most underrated bike you can buy"
"nobody else makes anything else like it"
"I could spend years owning and enjoying this motorcycle"
"overdid a roundabout, flew up a kerb at 50mph then yelped across a gravel drainage channel and an 18" deep grass ditch. Front suspension soaked up an accident that would have cartwheeled any other bike. ABS stopped me on grass without a lockup." The R11GS is just so completely different from my previous Japanese road rockets that it takes time to adapt and appreciate it. The local BMW dealer understood this so he gave me an extended test ride. Immediately I liked the comfortable upright riding position and the view you get ahead. I did not like its looks nor its weight and the indicator switches were a disaster. Riding it through town and then out onto the highway was easy but it somehow felt odd. Those wide bars, cylinders sticking out below you and some funny noises. Like nothing I've been used to. When I got home at the end of the day I sat down and thought about it. "Yeah its not bad, I like it now more than I did before riding it. But still there's no way I can buy one. It's just too, well, weird." Next day I hit the twisties. Wow, this bike really rocks! It is just so easy and relaxing to ride, leans to ridiculous angles and eats up bumps. You can ride fast without trying. And it's practical. The large tank gives a good range and the RID instruments tell you all you need to know. And it has so many nice touches e.g. center stand, rack for solo use and full toolkit. On top of that the ABS is so re-assuring. As I headed (fast) towards a hairpin I felt a slight pulsing from the rear end. "What's that?" I asked myself. Then I realized it's the ABS operating on the rear. "Oh" was my only reaction. I remained totally unconcerned and relaxed, completely confident that the system would slow me down enough to get round the hairpin under full control. There was none of the wide-eyed, dry throat panic and tension I would have felt if I had been on my bike in the same situation and heard the screech of the rear wheel locking up. Then there's the BMW build quality and the way they hold their value. Hell, I was even starting to like the looks! But above all else I enjoyed riding it, it made me grin. It's a fun bike. 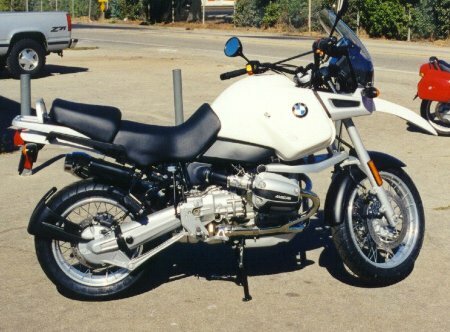 Yes, of course I took the bike back to the dealer and jumped on the BMW bandwagon. That was well over 18 months and 30,000 happy character-filled miles ago. Never regretted it. Not once. I've had the bike for 17,000 miles, put on one set of tires and brakepads at 11,000. Other than that, I have had no problem - I love it to death. The R11GS is an able offroader, grand tourer AND canyon carver. Several mags give it 'best dual purpose' but really it needs it's own category 'best all arounder'. I like the riding position and use the original seat but many change to Russell or Corbin aftermarket replacement. I use the stock shield even though the wind hits the average size rider in the face and upper chest. 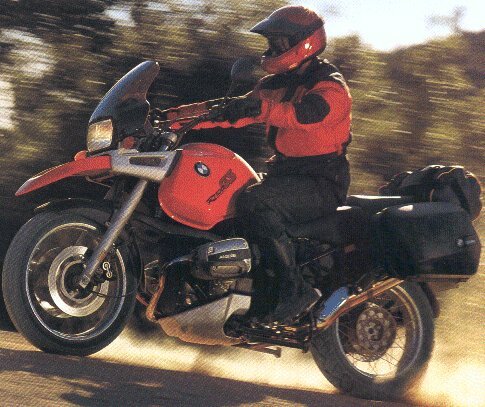 Many tourers opt for Aeroflow or Parabellum aftermarket replacements. Too heavy to be a dirt bike of course, but I take it offroad with confidence. Really eats up speed bumps at the local mall. Can't park it anywhere in public without attracting admiring glances and comments. The most fun "thing" I've ever bought. Jesse bags make it a round the world tourer and perfect Baja bike. Removal of the rear seat and bar leaves plenty of storage room. Absolutely the best bike in the world for extended camping/touring. Can't think of a better bike if you only have one. I have only been riding one year but I keep up with my friends on sport bikes on mountain roads. I can't stop riding it - have 2 cars with dead batteries because of it! I was eating breakfast alone at a cafe one Sunday morning when a nice couple off a new red R11GS came in. I told him I've been eyeing his GS. He handed me his keys and said try it out. WOW! Now that was 26,000 miles ago. I get lots of wind and it vibrates some. It eats dirt and gravel roads but loathes sandy river beds. As for the blacktop you can do it all - fun, fun fun! Find a dealer that'll let you ride twisties for an hour or two - you gotta try one! The R11GS is tall, heavy and a bear if it gets too far off center at a stand-still. But once in motion, it's like a weeble-wobble - very stable with a comfortable center of gravity. Without the saddles, regardless of the amount of fuel in tank, the bike literally balances on the center stand with both wheels off the ground. I personally cannot take my eyes off her whenever I wander out to the garage. Unless you're an experienced offroader, I'd take that in VERY slowly. It handles much differently than a lighter enduro (duh!) and sudden deceleration causes skidding. But udder'n'dat, my bike seems flawless and is pure joy to ride. I have a 95 R11GS with 2,000 miles (all city!). As a former Honda owner who attempted to drive long distances while balancing on my wrists, I have found the R11GS to be quite a thrill. It's primary purpose in my life right now is as an urban assault vehicle and it works perfectly. No more worrying about Chicago potholes swallowing another wheel, and the roads are wide enough that pretty much one car and one bike can move along during rush hour. can be parked almost anywhere. In the two months since I bought my R11GS I have done about 4,800 miles. I use it for commuting from the high desert where I live, to Pasadena, 80 miles away. About 60 of the miles are freeway and the other 20 miles are street. Going home, I take the mountain route (when it is not raining or snowing) and have about 40 miles of twisties and 40 miles of desert highway. These are the best parts of my day! The R11GS is an amazing motorcycle. You have the power and speed needed for the freeway/highway as well as cornering ability with balance. When you want to split lanes because traffic is moving intolerably slow, the bike is steady and stealthy. If you have a hankerin' for offroad, the bike is built for this also (albeit, you better have more aggressive tires than what comes with the bike). The ride is about as smooth as you are going find for a two-cylinder bike. Typically, my ride is about 1.5 to 2 hours in the morning and about 1.75 hours in the afternoon. My rear, however, does not feel like it has been on a motorcycle seat for that long! After riding pure dirt bikes and pure sport bikes for years, I always kind of looked down on the GS style of bike. Finally, as I drove by Ginas BMW in Iowa, I decided to try a test ride on a R11GS. Gina let me have her black R11GS demonstrator and said "Keep it under 4500 rpm and out of the mud." As I threw my leg over the 'monster' it felt strange... the GS reminded me of my dirt bike, nice wide bars, good seat height and neutral balance. A two finger clutch and easy to read gauges made me feel right at home. BUT then I looked down and I saw those funky cylinder heads sticking out! When I fired it up, I got my second big surprise. When I blipped the throttle the bike torqued SIDEWAYS.....! absorbs potholes and expansion joints in the road with ease. Great Urban Assault Vehicle!!! But what was it like on the open road? I headed up toward Coralville to a nice set of twisties. No Problems!! This beast could lay right down through the apex of the curve, roll the throttle on about apex exit and BLAST. It didn't even mind that there were big rolling lumps of asphalt right in the middle of the curve. The suspension just soaked them up and kept my line. The cruise back to Ginas' was about 30 miles of Interstate 380, a steady 75 mph and a 30 mph crosswind were taken in stride. Gina had a Marrakesh red one on the showroom floor. I told her to get it ready. I rode it home a few days later. I have since done some 'fire roading' with it. It has done some 2 track jeep trail camping. It has cruised 500 mile days on the interstate and I have had loads of fun with it in my daily commute to work. Sure, I've nicked the cylinder heads and I've scraped the skid plate. I expected that. 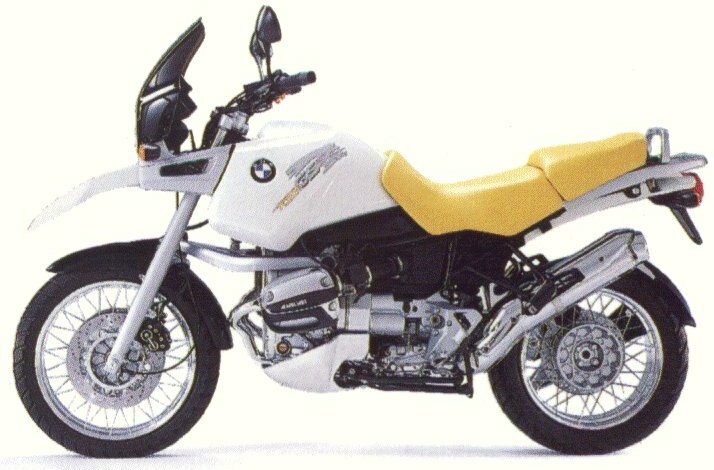 As for getting the GS serious offroad... I won't do that, I didn't spend $14,000 US to smash it. I have a XR400 that is much cheaper, not to mention easier to pick up. As for my VFR, I traded it and have never missed it. The GS is by far the best motorcycle I have ever owned. There are more stories and thoughts of owners on their R11GSs in the owner's survey. In the 10 months since picking up my GS I have done over 24,000 miles and she just gets better and better. She is my "horse" - my every day, do everything, commute/tour/carve canyons bike. FANTASTIC!! Sure, I have minor complaints. But there's no bike on the market today which does everything, and I mean *EVERYTHING*, like a GS. I fully expect to do over 300K miles on her. The GS is a most wonderful bike. 129,000 miles with an excellent dealer, nothing but sMiles. (Warranty took care of a few small problems quickly and easily). My buddy here in Colorado has taken his 95 R11GS to Alaska, Copper Canyon and everywhere in between. He's done approximately 45,000 miles on it. My R11GS is nearly perfect. It will be perfect when I can afford to fit a replacement Aeroflow screen with lowers. The R11GS suspension and high ground clearance make urban assaulting lots of fun! Only problem is that the saddlebags limited lane splitting. So, I mounted a Givi 50 liter top case and removed the saddlebags making the bike is nice and narrow again. And the Givi has lots of room! The R11GS is certainly comfortable. I did one long-ish trip on it, San Francisco to Phoenix and back as well as a couple of 800 mile days along the way. Great bike. I've done 36,000 miles in the last 17 months on my 96 R1100GS. Alternator belt at 31K as it squeaked on occasion. Old belt was fine. New belt squeaks too on occasion so this was not really necessary. Cost $10 or so for the belt (not sure on this) and about $15 to put it on. Clutch cable thinking it was going bad. It wasn't. Cost $20+ for the belt and $25 for the dealer to put it on. Clutch throwout bearing died at 33K. Replaced free under warranty. If not warranty I'd guess 2 hours labor and not sure of the part cost ($25?). I'm still using the original brake pads at 36K. One of the rear pads is a bit thin but still fine. I do ride the bike hard on the street. It gets about 5% offroad duty. My bike is totally stock except for the addition of a Corbin seat, Piaa lights, and a Bob's Wrist Rest. The Corbin is just the front portion with a back rest. Nice for those long days. The PIAA 910's are excellent for finding those night critters. The Wrist Rest doesn't get that much duty, but is a nice addition. Oh yeah, I tossed the stock headlight bulb at Day 2 and went to 55/100W. I've tried both the Bridgestone and the Michelin tires. My bike came with the Bridgestone Trailwings which were okay but didn't seem to last too long. The next 3 sets of tires were Michelin T-66's. Last long, handle well, make noise. I recently put a new set of the Bridgestones on as I was on the road and the remote dealer's prices on Michelins was astronomical and the Bridgestones reasonable. I'm not as confident on the Trailwing's though. I have had my R11GS 15 months since buying her new and have done 23,000 miles. She's been dealer serviced and they have never had to do anything extra, nothing other than what's in the schedule. I'm on my third set of Metzeler Enduro 4 tires which I like except for the front tire cupping. Tried the Michelins and Avons when I rode some other R11GSs but much prefer the feel, steering, quiet and grip of the Metzelers. I never ride offroad. Apart from that, the only thing I've had to do is replace some bulbs (one headlight and three rears). A great allrounder - I'm very happy with her. An R11GS is usually a good buy secondhand even at high mileages. They are well-built and BMW has a good warranty and recall mechanism for updates. 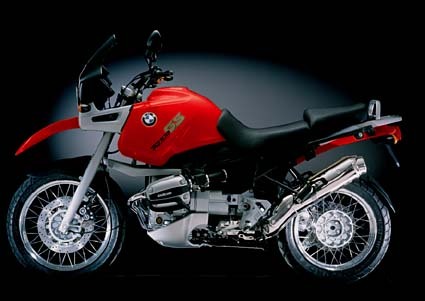 Previous GS models suffered from poor drive shaft life and unreliable alternators/starters. The R11GS does not. The original R11GS models had a number of failings but in typical BMW fashion most of these have been corrected by now so they are still a good buy. Check for a full service history. If at a dealer, try to speak to the previous owner. Even at high mileages, well serviced bikes tend to remain reliable. Check whether the tank is plastic or metal. Lots of the plastic tanks were replaced with metal ones under warranty. Check plastic tanks carefully - they suffer problems with their mountings wearing and paint/decals bubbling. a) Check the mountings by lifting the front of the tank. Play of more than an inch is a problem. b) Examine the decals (if there are any!) for bubbling. Don't be put off by strangely colored exhaust headers. All shades of blue/violet/brown are possible. It's good quality stainless steel. Only worry if there are holes! Early models suffered gearbox and occasionally shaft troubles although most have been sorted long ago. Check the spoked wheels carefully. Their unique design means the rim cannot be "pulled" left and right by spoke tension as with a normal spoked wheel. Only expert wheelbuilders can rebuild these wheels. Even spoke tightening/replacement is beyond most dealers. Spin each wheel to measure the run out (i.e. how "bent" the wheel is). If it is more than 1/8 inch usually this means replacement (not cheap) or rebuild by a specialist wheelbuilder. Look for missing spokes. Up to three missing spokes per wheel can be replaced but this is not straight forward and sometimes the wheel needs rebuilding anyway. Gently strike all the spokes on both wheels. They should all "sound" the same. If not, replacement or a rebuild may be required. For more details see wheels. Models produced before Feb 1996 have a less robust rear rack. Examine the underside closely and look for cracks. If it is cracked, dealers may fit the upgraded part (number 46 54 2 309 514) for free as per a service bulletin. On a test ride ensure ABS (if fitted) works correctly as faults are expensive to repair. When the ignition is turned on the two ABS warning lights should flash together. (If they flash alternately, the ABS needs resetting). As soon as the bike travels a couple of yards both ABS warning lights should go out. When it is safe to do so, test the front and rear brakes separately to make sure the ABS works.